AP Japan Blog: May 2nd for Music Fans. May 2nd for Music Fans. As HappY as this day is for some, it also is a day of mourning for others. For some reason, people STILL seem to mix up "hide" (pronounced "he" as in "HE DID IT", "de" as in "day") with "Hyde" (pronounced "Hai" as in "HI! ", "do" as in "dough". The English pronunciation is also used since it's supposed to be an English name.) from L'Arc~en~Ciel. So for the second year in a row, I'm writing this, again (with a few changes) in hopes further confusion can be avoided. Heavily influenced by KISS during junior high, hide's love of music started. 1981 -1986 hide led the indie band Saver Tiger (later, Yokosuka Saver Tiger) . 1983 he started "cosmetology and fashion school", graduated with an award in 1984 and soon received his beautician license. 1987 Yoshiki of X , asked hide to join in which hide became lead guitarist and song writer including "Scars", "Love Replica", and "Sadistic Desire". During his time with "X", he hired a band and worked on solo albums "Hide your Face" in 1994 and with his popularity he recorded his second album "Psyence" in 1996. After X (then, X-Japan) broke up in 1997, he even went as far as working with Zilch (an American band) in hopes of doing what "X" couldn't and break into the American Market. After his time there he went back to the back up band that helped him with his first solo album and thus "hide with Spread Beaver" was born. Unfortunately during the making of Ja, Zoo their first album, and talking with Yoshiki on reuniting X-Japan... hide was found dead, hung to a doorknob on May 2nd 1998. "Pink Spider" was awarded the Japanese International Viewer's Choice Award at the MTV Video Music Awards. The remainder of the album and performances were made by voice samples and help from his brother, Hiroshi Matsumoto. 50,000+ people came to hide's funeral where the former members of X-Japan tributed him by singing "Forever Love". Several tribute albums have been released including "hide Tribute: Spirits" released in 1999 which has the likes of GLAY, Siam Shade, Buck-Tick, Luna Sea, and old band mates I.N.A, Pata, heath, and Yoshiki (to name a few) re-doing hide's notable songs. 2000 "Psychommunity", and 2004 "King of Psyborg Rock Star" which includes live performances, re-mixes, and hide only, X songs. To this day, the "hide" section in many music stores are still sold out. Even though this day marks the end of an era... in March of this year, Toshi (of X) announced that he a Yoshiki (of X) have started working together and hope to reform the band later this year. Sorry I only included GLAY's version of "Misery"... Besides Buck-Tick's version of "Doubt", others that I have found were made by fans or of poor quality. The have such good music though. Music is Universal... even if the lyrics may not be understood, the melody can still be enjoyed by many walks of life. One of the main things SIU used to try to teach during the school festivals. 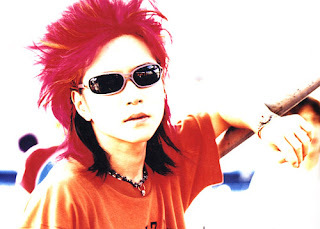 Its still sad that Hide's gone *cries*...I still listen to all the music you sent me Kami. Sorry im not on much anymore, I still pop in from time to time, I never see you on anymore so I never stay.